A folding table (and two fauteuils à la capucine) in use at the Manoir Mauvide-Genest. Société d'histoire In Memoriam. Such portable table tops- essentially wooden boards- and folding trestle forms like Cambon's could be used and moved about a home as needed. In 1740, the royal notary Jacques Barbel of Québec owned a pine table top and its folding stand or trestle. Even Philippe de Rigaud, marquis de Vaudreuil and governor-general of New France, relied on trestle tables in his official residence at the château Saint-Louis in Québec. Although the plans for the château describe an actual dining room or ​salle à manger, such conventions were as slow to take hold in New France as they were in France. When it was inventoried in 1726, the room in the château that corresponds to the one identified as a dining room on the architectural plan contained few items apart from some trestle tables. Covered with an abundance of textiles and set with ceramic or metal serving wares, the rustic nature of these tables in even the most well appointed homes was well hidden. Tables for a variety of uses including eating, general decoration, leisure, writing, and work appear in French colonial inventories. Providing a surface for these activities, they might also contain drawers for storage, as seen in royal notary Jacques Barbel's two-drawer table. Inventoried his chambre in 1740, this table was embellished with a veneered top, described as very old. Tables were rarely conceived with a purpose as specific as eating in mind, although explicit references do exist, often in the homes of public officials and social elites who were expected to host social functions. A "grande table à manger," or large dining table, was inventoried in the salle of Charles Guillimin, a member of the Superior Council in Québec, in 1739. Another was described in the salle of Claude-Michel Bégon de La Cour, governor of Trois-Rivières, in 1748. In 1764, royal notary Pierre Tiphaine owned a table "large enough for eight place settings" in Saint-Pierre, Martinique. Also in Saint-Pierre, Jean Cambon, substitute prosecutor for the royal admiralty, owned a table à manger with a folding base that was likely used in tandem with a turned table in his home's galerie in 1766. With its single folding leaf, a pine table like the one at right could be placed against the sides of a room for easy storage when not in use. 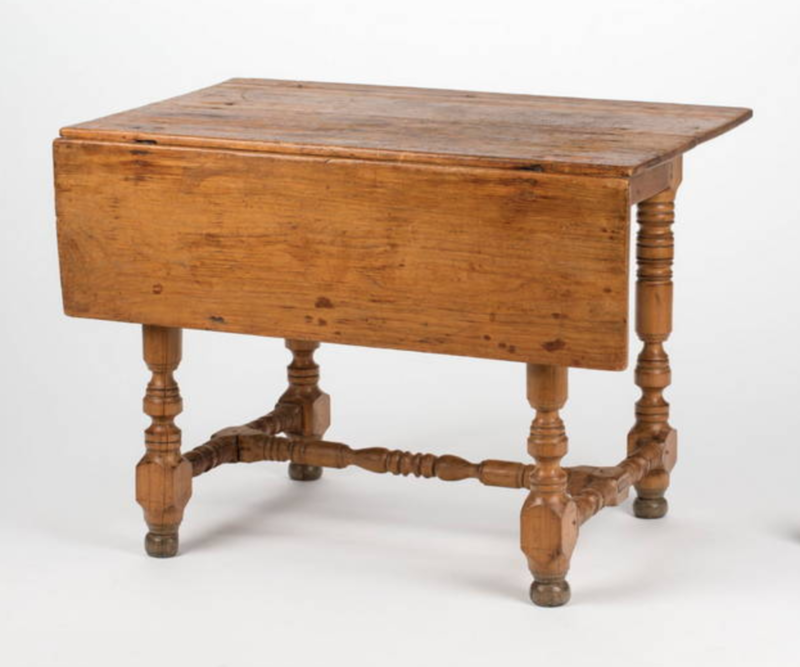 Although this table appears to have been made in Canada, Anglo-colonial gate-leg tables were also likely present in New France. The French Canadian taste for turned furniture is evident from both documentary sources and surviving furniture, and Anglo-colonial tables and other turned pieces likely found themselves quite at home with furniture made in New France. Although documents and surviving furniture point to the importation of tables from France and their manufacture by French colonial craftsmen, tables might also be acquired through intercolonial trade. The 1741 inventory of Marie-Suzanne Basannière, the widow of Claude-Joseph Desmarest, a Louisbourg notary, reveals the couple's ownership of a "table à l'anglaise." 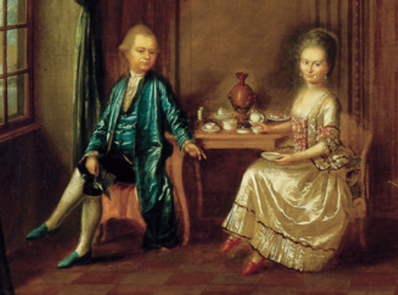 The "English" Queen Anne table seen at left offers an interpretation of the one owned by the Desmarest couple and probably acquired via illicit intercolonial trade between French and English merchants and shippers. In 1755, Jacques-Hugues Péan de Livaudière furnished the salle of his home in Québec with a "table anglaise pliante," or "folding English table," that might have been a New England drop-leaf table like the one seen below. 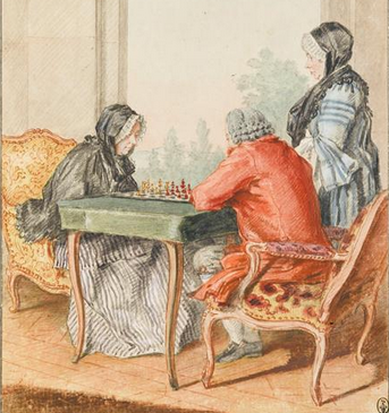 Notaries appraised three gaming tables- two for quadrille, of which one was walnut, and one walnut piquet table- while settling the New Orleans estate of François Goudeau, a native of La Rochelle, in 1759. Goudeau arrived in Louisiana in the 1730s, serving as "King's Surgeon" at the Post of Natchitoches before being transferred to New Orleans. There, he married Marie Pascal, the daughter of a successful albeit illiterate innkeeper, Élisabeth Pascal-Marin. He died in 1758 after being taken prisoner by the British during a trans-Atlantic voyage. One of Goudeau's quadrille tables and the piquet table were covered with green cloth, probably felt or baize, creating a soft, comfortable surface upon which to play at cards and pursue other amusements. Given the fashion for gambling and games of chance in France, it is no surprise that New World elites sought to recreate such metropolitan trends in Canada, Louisiana, and the Caribbean. The 1766 succession of Jean ﻿Cambon﻿ in Martinique also references "an old table à cadrille" with a green fabric top in the salle; another in bad condition was stored in a cabinet. 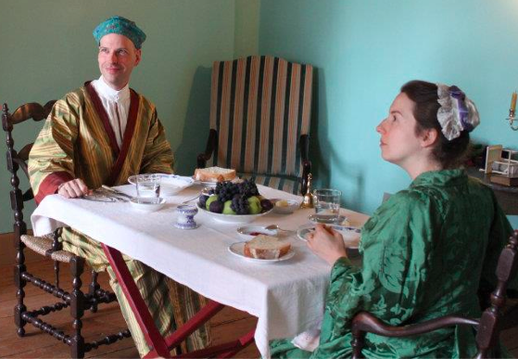 As late as 1773, the indigo plantation of Étienne Martin de Vaugine de Nuisement, a former French military officer in Louisiana, was still furnished with a quadrille table covered with green cloth. Although it is possible that specialized forms like gaming tables were imported from France, documentary evidence points to some having been made or at least repaired in the colonies. In 1769, Jean-Baptiste Prévost, an agent of the French East Indies Company in New Orleans, owned two walnut quadrille tables with cypress tops, one with a yellow cloth. The use of cypress for the table tops would indicate that they were either made or reworked in Louisiana. Descriptions of gaming tables in elite homes from Québec to Martinique appear by the second quarter of the eighteenth century. The inventory of Marie-Madeleine-Louise de Saint Vincent, baronne de Narcy, describes one in her house in Québec in June of 1742. A daughter of Jacques Le Vasseur de Neré, a military engineer and naval captain awarded the prestigious military title of chevalier de Saint-Louis, the future baronne was born in Québec in 1694. She married her husband the baron de Narcy, a native of Champage, in 1719. He left Canada for France with their three children in 1760. ​The gaming tables owned by the baronne de Narcy, Goudeau, and Vaugine shared a common stylistic trait described as pied de biche. Pied de biche translates to literally to deer or doe foot or hoof, but in period parlance was used to describe tapering cabriole legs with and without specially carved feet. Stylized carving and ornamental metal mounts resembling cloven animal feet appeared on European furniture before 1700. In France, this sort of ornament became especially prominent in transitional and rococo furniture forms including chairs, tables, and case pieces. Surviving tables from Louisiana show that actual hoof-shaped feet did find favor in French colonial America and could in fact be reproduced there by local makers who followed metropolitan trends including the ubiquitous cabriole leg. Other documentary references to pied de biche furniture include the 1732 estate inventory of Jean Petit, a marine treasurer, which recorded a pied de biche table in his Québec home. It was described as green, suggesting that it might have been painted. Returning to Louisbourg, the 1741 inventory of goods held in common between Claude-Joseph Desmarest and his wife Marie-Suzanne Basannière describes a "very common" pied de biche table. In 1756, Louise Mariauchau d'Esgly, the wife of merchant and Labrador commandant François Martel de Brouague, furnished her salle in Québec with a pied de biche table. The commissaire-ordonnateur of Louisiana, Vincent Guillaume Le Sénéchal d'Auberville, and his wife Marie-Françoise de Coulange owned two pied de biche tables, one of walnut and the other of cypress, in New Orleans in 1757. Pierre-François Brunot Lefebvre made use of two such tables in 1772 in Saint Louis, Missouri, where another of walnut was inventoried among the possessions of Louis Groston de Saint-Ange de Bellerive in 1774. The inventory of François Drouet records a pied de biche table of local wood at his home in present-day Fort-de-France in Martinique in 1777. 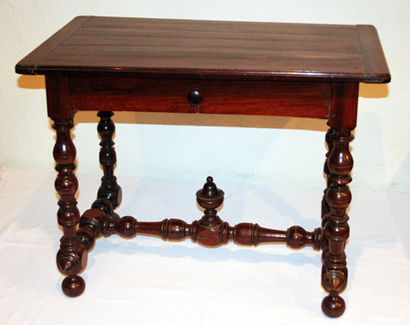 As late as 1786, Marie-Charlotte Bruslé, the widow of a member of the Superiour Council of Saint-Domingue, owned a mahogany pied de biche games table with a green cover inventoried in the salle, with two other mahogany pied de biche tables in another room in her home in Cap-Français. Most archival sources do not describe any specific activity associated the use of these small tables, and it is possible that pieces identified as card or game tables served a number of purposes. Specific mention of cabarets or tables en cabaret can be found in several colonial inventories. Small and imminently portable, such tables were used in conjunction with beverage service and marked great convenience within a household.​ The tops of such tables might be flat or slightly curved, taking the form of a cabaret or tray. 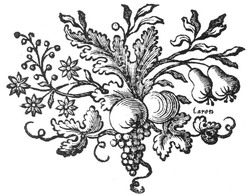 The 1781 inventory of Jean Lacou Dubourg and Marie-Jeanne Isambar of New Orleans describes a walnut "cabaret à pied de biche" that might have resembled one seen in a drawing of Mademoiselle Lebrun by Carmontelle. The inventory also reveals an impressive amount of French and British ceramic wares for serving coffee and tea. Additional discussion of cabarets and tables en cabarets can be found here. Probably cut in the nineteenth century, portraits of Charles Laveau Trudeau and his wife Charlotte Perrault of New Orleans depict the sitters at a wooden table with a scalloped skirt similar to the above table's. The surface of the table in the portraits below is used to support a gameboard for trictrac, a French variant of backgammon that was especially popular in the seventeenth and eighteenth centuries. Although it was likely placed against a wall when not in use to conserve space, this walnut table's scallop-shaped skirt can be admired on all sides. The table is long enough to accommodate a chair, and could easily have been brought out into the center of a salle or chambre and used for entertaining, perhaps for coffee or gaming. It could just as likely to have served as a dressing table. Its convenient size, proportions, and utilitarian drawer suggest a multi-purpose use. The discreet drawer was never outfitted with a pull or knob; instead, its contents were accessed by placing a hand underneath and sliding the drawer out. ​Also of walnut, the two smaller pied de biche tables seen below reveal more specific functionalities. The example to the left might have served as a console, or pier table. It was never outfitted with an ornamental skirt on the side opposite the drawer, a detail that argues for permanent position against a wall, perhaps between two windows if not simply next to a bed. With its unusual diagonal cross- or saltire-shaped stretcher, the walnut table on the right is unique in its overall design. Its earliest provenance places it in Ursuline convent in New Orleans, and it is the only documented table with such a stretcher, echoing the earlier os de mouton form. Its form and size suggest that it was used as a sort of nightstand or bedside table, known as a table de chevet or table de nuit. Perhaps it served one of the Ursuline nuns, or was used by a boarder. It is easy to image its dual use as a combination nightstand and makeshift dressing table. Mentioned above, the 1769 inventory of Jean-Baptiste Prévost records two tables de nuit with pied de biche feet at his plantation just outside New Orleans. Made of mahogany but discovered in New Orleans, this single-drawer table might have been made on a Caribbean island and traveled to Louisiana from there. It could also very well have been made in Louisiana from imported mahogany timbers, although its construction is unique among other surviving tables from the region. A tropical hardwood, mahogany or acajou was not unknown or even uncommon in colonial Louisiana, although it became more common there towards the end of the century. It was certainly ubiquitous in the West Indies, and its resistance to insects made it ideal for furniture construction in tropical climes. The 1757 probate inventory of Claude-Joseph Villars Dubreuil mentions "une petite table de bois d’acajou à pied de biche" at his home, a brick house downriver from New Orleans. A prominent immigrant planter and engineer, Dubreuil was responsible for much of the construction of French colonial New Orleans. Deported to France for his involvement in the 1768 rebellion against the Spanish takeover of Louisiana, the Canadian-born ordonnateur Denis-Nicolas Foucault owned a number of pied de biche tables, including two in mahogany, one with a Morocco leather top; these were among his property inventoried at Monplaisir, a plantation across the Mississippi River from New Orleans belonging to his mistress, Alexandrine de La Chaise, in 1769. Wherever this mysterious table was actually made, it points to how artistic styles and forms such the pied de biche were quick to make their way across the Atlantic. Although the table reflects the use of an indirectly local resource from the greater Caribbean Basin, European fashion would have given form and meaning to the finished product in Louisiana, whether it was made there or not. ​Its small size encouraged intimate exchange between those who used it and certainly benefited from its portability. ​At least one inventory, that of Jacques Fortier of Montréal from 1747, uses the word guéridon to describe a small pine table or stand valued 10 sols. This form was typically used to hold a lighting implement, whether a single candlestick or more elaborate candelabrum or chandelier. A few surviving early candlestands have surfaced that are possibly French Canadian in origin. The generally feature octagonal tops with chamfered bottom edges that are held aloft by turned supports and set on x- or cross-shaped bases, as seen at left. 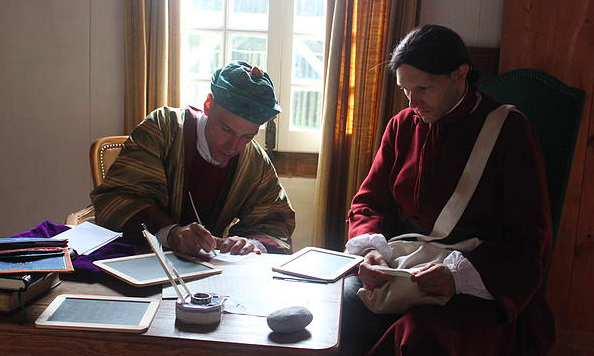 Like books, the ownership of writing desks and related furniture symbolized elite identity and the literacy enjoyed by colonial elites, whether through private tutors or in French or colonial institutions of learning including convents and seminaries. A French desk or bureau in the collection of the Augustinian Order of Québec contextualizes references to similar pieces of furniture listed in colonial archives. An "old" veneered desk with five drawers worth 30 livres was among the items inventoried at the château Saint-Louis, the Québec home of the governor-general, in 1726. It was documented in the chamber probably occupied by Louise-Élisabeth de Joybert de Soulanges et de Marson, who became marquise de Vaudreuil upon her marriage to the future governor-general in 1690. Born in Acadia in 1673, this colonial-born noblewoman journeyed to Versailles in 1709, remaining there for twelve years as she sought favors and positions for herself and her family on both sides of the Atlantic. She returned to Canada in 1721, but settled permanently in France after her husband's death. She died in Paris in 1740. The marquise de Vaudreuil was not the only person to own such furniture. The 1734 estate of Jean Crépin, a counselor of the Superior Council in Québec, included a "pupitre à ecrire," possibly an upright writing desk or desk on frame. Marie-Anne Lavergne, the widow of bourgeois merchant Étienne Fréche, owned a "table de bureau" in her home in Québec in 1752. Similar exchanges in furniture and other goods took place in the Caribbean Basin. In Louisiana, Vincent Guillaume Le Sénéchal d'Auberville owned "un Bureau Englois ou secretaire" of mahogany in 1757. French Martinique was occupied by the British from 1762 to 1763. Mathieu Gauzence, a merchant in the settlement of Marin in Martinique owned three "English" desks, including one varnished or lacquered desk, in 1770. The 1777 inventory of François Drouet mentions a locking "English" desk of cedar with multiple drawers and copper hardware. In New Orleans, Nicolas Lacour Dubourg made use of a lockable "bureau à l'anglaise" of mahogany with copper hardware in 1781. Notary Florent Lacetière owned an "English desk with several drawers" in 1729. The desk on frame seen below was possibly made by Huguenot cabinetmakers working in New York. With its bold, Mannerist turnings not unlike those of French Louis XIII style furniture, it could easily fill in for Lacetière's desk in Québec. Much "English" furniture arrived in French Canada through illegal trade networks and smuggling between French colonial ports like Louisbourg and New England, especially Newport, Rhode Island, and Boston, Massachusetts. French sea captain Jean-Pierre Rossignol’s decision to bring such “English” furniture to Louisbourg helped to land him in hot water with the authorities. He was charged with conducting foreign trade in “Rodeland” (Rhode Island) when his ship the Aimable Rose docked at the fortress in the summer of 1750. The ship was seized by the state along with its contents, including an “English” desk.